Lorraine began jewelry making in the 1970's. She learned her trade by watching and helping her parents Alice and Duane Quam and grandparents Doris and Wayne Ondelacy. Her skills as a stone cutter and her husband Luwayne's skills as a silversmith combined are those of past masters. 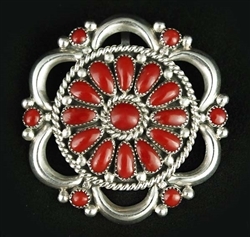 Their cluster Zuni jewelry is very collectable, as each piece is done with amazing precision. Her use of high quality materials, both in the turquoise and coral she chooses for her pieces, are also a hallmark of her beautiful work. This beautiful cluster pendant/pin is set with 19 hand cut Mediterranean (ox-blood red) Coral cabochons. The silver design with twist wire and perfectly placed silver raindrops add the final touches to this gorgeous piece. 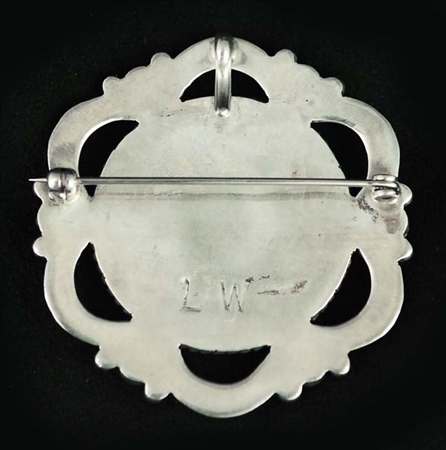 Hallmarked with her LW. The pendant/pin measures 1 5/8" in diameter.